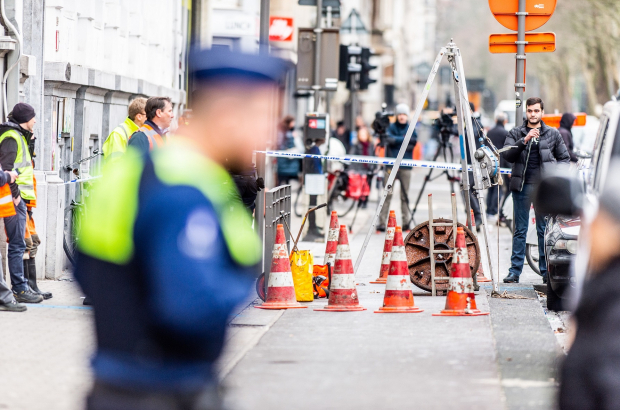 A man has been arrested in connection with the spectacular robbery of the BNP Paribas Fortis bank on the Belgiëlei in the centre of Antwerp. The bank was robbed on Sunday by an unknown number of thieves who crawled through sewer pipes to reach the bank’s safety deposit boxes. The break-in made international headlines because of the extraordinary effort taken by the thieves, who dug a tunnel from the basement of a home around the corner from the bank to the sewer. They also had to dig a tunnel from the sewer line in Belgiëlei to the bank. The thieves would have had to crawl or shimmy through two blocks of piping, which has wastewater flowing through it. “I don’t know how they managed to get out of there alive,” Els Liekens of wastewater treatment service Aquafin told Radio 2. Depending on the amount of water use in the neighbourhood, pipes can fill up with water quickly, which would have posed a risk of drowning. Waste in the water poses a biohazard, and, said Liekens, so do gasses. Digging the tunnels, meanwhile, would also come with a risk of the ground above caving in. The thieves were either remarkably well prepared, or very lucky. According to VRT, 20 to 30 bank deposit boxes were compromised, though the bank has not yet released the total value of the heist. Anything stolen will be covered by insurance. Yesterday police arrested a 27-year-old man in connection with the robbery. He does not live in the home from where the tunnel was dug, and his connection with the break-in has not yet been revealed. According to police, he is being held on suspicion of robbery and membership in a crime syndicate.